Wow. The TV manufacturers of the world just excreted a gajillion alphanumerically named HDTVs at CES. We cruised the booths, parsed the display technologies, connectivity features, claimed performance and specs, and found the one we think is the best. As the successor to the best plasma of 2010 (the Panasonic TC-PVT25), the new THX-certified VT30 series gets bigger (growing to 55- and 65-inches), promises even more sinister black levels, and comes with the ability to perfectly reproduce the cadence of 1080p/24 sources. Maybe. We won't know till we try it ourselves. We're just happy the company finally managed to gussy up the exterior—cutting some fat from the bezel and adding a classy sliver lining. If you want a truly fantastic 3D (or 2D) HDTV this year, this looks to be the set to beat. 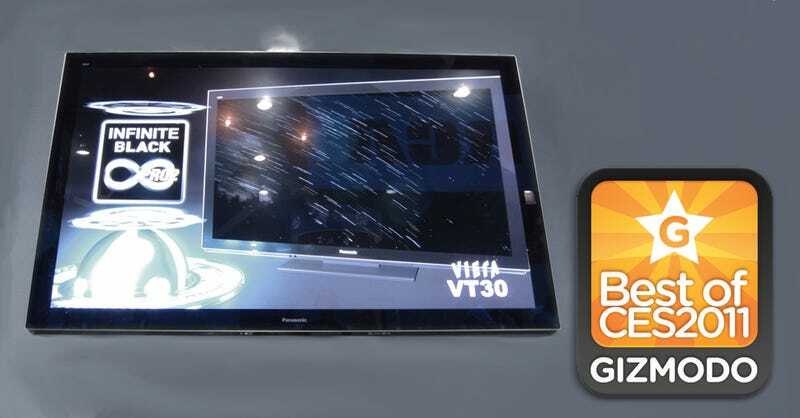 Sony XBR HX929 Series: Sony alone added more than 25 new sets to its HDTV lineup for 2011. Ugh. But it's the company's flagship LCD that looks most promising...at least on paper. The 3D-ready set comes with built-in wireless-N, a full array of local dimming LED backlights, and some deep, deep blacks. Alas, you won't get a pair of active shutter glasses included in what is sure to be an already steep price tag. Boo. Samsung LED D-8000 Series Equipped with improved local LED dimming to boost 3D performance (less cross-talk and ghosting) and a sleek touchscreen remote, the D-8000 Series is as gorgeous as ever. There's even a plasma version.